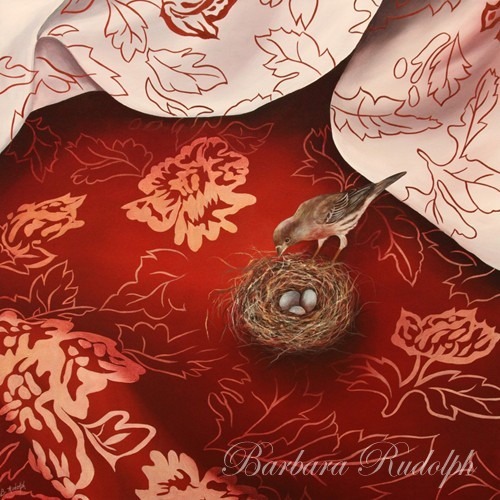 Barbara Rudolph Fine Art: Red White & Blue Oil Painting "Arriving In Style"
Red White & Blue Oil Painting "Arriving In Style"
I was trying to think of a painting that I have that is "Red White and Blue" for the "4th of July" ... that is also still available. This oil painting "Arriving In Style" is "Red White and Blue." It is painted on gallery wrapped canvas so the design continues around the edges of the canvas. The size is 20x20x1.50". It features a mother "bird" waiting for her eggs to hatch in style. It is priced at $2000. but for the month of July only I will offer this painting for sale at "half price". It was a lot of work and is also a very cheerful painting that will brighten up any room. You can contact me with any questions or if you would like to see a high resolution photograph. Your comments are welcome too, just click on the comment link below.